In summer, passenger ferryboats run to Nantucket from Harwich Port and Hyannis MA on Cape Cod, and from the neighboring island of Martha's Vineyard MA. The most convenient ferry departure point is Hyannis, with the most ferries and lowest fares. Small commuter airlines operate non-stop flights to Nantucket from Boston, Hyannis, New Bedford and Martha's Vineyard, Massachusetts. 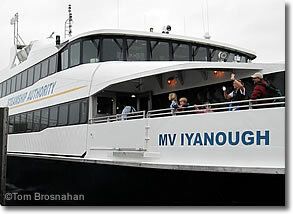 m/v Iyanough: fast catamaran passenger ferry from Hyannis MA to Nantucket Island.